Tusculum University lost a dear member of its family on Saturday, January 12 with the death of Margaret Gaut, but in the midst of our sadness, we celebrate that she was an integral part of our institution for so long. 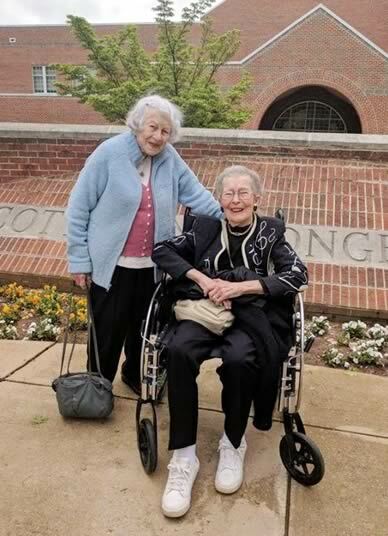 This photo shows Margaret Gaut, left, with fellow 1940 graduate Ann Beeson Gouge on the Tusculum campus. Margaret was a member of the Tusculum College Class of 1940, and she turned 100 in June. It is appropriate she achieved such an important milestone in her life just as Tusculum was about to embark on a new era as a university. In fact, when she celebrated her birthday in June, the university was able to tie the two events together when Dr. James Hurley, Tusculum’s president, presented her the first diploma bearing our new name. It was a fitting way to celebrate our rich history as we advanced our university to the next stage of development. This was not the last time Dr. Hurley and Margaret connected. She was in the audience when the university celebrated his inauguration in October, and their smiles and First Lady Kindall’s when they took a group photo after the ceremony demonstrated how that moment added an extra measure of joy to the occasion. Margaret graduated from Tusculum with a Bachelor of Science in Home Economics and pursued post-graduate studies at the University of Tennessee. As a Tusculum student, she was a member of the Cicero Society. After graduation, she continued to demonstrate a love for her alma mater, serving as Alumni Association president as well as a member of a presidential search committee and the External Relations Committee of the Board of Trustees. Even in the later years of her life, she was a member of the Alumni Executive Board. Margaret also served as a class representative and phonathon volunteer. Tusculum recognized her contributions by bestowing the Pioneer Award, the Alumni Association’s highest honor, in 2001. And in 2015, Tusculum presented her with the Distinguished Service Award at the President’s Dinner. Margaret’s relationship with the Tusculum community is all-encompassing. In addition to her involvement with the university, she was raised on her ancestral farm in the City of Tusculum. In 1946, she wed William King Gaut Sr., and they were married for 61 years before he died in 2008. They had two children, Elizabeth and William Jr.
During her youth, she was a member of Shiloh Cumberland Presbyterian Church and later became a member of Greeneville Cumberland Presbyterian Church. She accepted ministry roles in both churches. She was an active alumna in the community until she needed to move from her Tusculum Home to Morning Pointe Senior Living due to health concerns. In her professional life, Margaret served for 31 years in the education programs in Greeneville and Bristol, Virginia. Margaret was an outstanding representative of Tusculum in all respects, and we are grateful for the exceptional legacy she leaves us. We extend our condolences to all of her family and ask you to say a prayer of gratitude that God brought her into our lives.